Last Monday evening Embedi published the PoC referred to in their report and on Tuesday we released a micropatch for the vulnerability. Here is the analysis. The PoC is in form of an RTF file that, if opened in Microsoft Word, immediately pops up calc.exe. To accomplish this, Embedi overflowed a string buffer on the stack with an overlong font name applied to an equation text. As shown in their WinDbg screenshot, the overlong font name contains a command string to be executed followed by padding A's until a trailing return address to a WinExec call at offset 2Ch that is supposed to execute the command string. Apparently the WinExec call address, located at font string offset that is already out of bounds of the designated buffer, replaces a legitimate return address on stack so when the vulnerable function returns, the payload gets executed instead. What was Microsoft's official patch? As already said in our previous post, the diff of EqnEdt32.exe between versions 2017.8.14.0 and 2000.11.9.0 showed only 5 modified functions. Running the PoC with WinDbg attached showed that it executes one of the patched functions, sub_0041160F. There were 5 changed blocks of code in that function, but it turns out the relevant patch that blocks the PoC is the topmost one. This patch consists of an added boundary check (top square on the left) and buffer truncation code (bottom square on the left) to a vulnerable memcpy operation that overwrote a stack buffer as previously mentioned. The conditional is placed after counting bytes to be copied from arg_0 to var_28 and makes sure that if the source string is too long, only 0x20 bytes are copied and zero-terminated. However, this is not the biggest difference applied to the vulnerable code block. The most code reorganization and, we believe, effort had to be put into the middle square where the developer replaced the compiler's memcpy implementation on the right with a more compressed alternative to gain space for injecting the aforementioned security check. With this micropatch we did the same thing as Microsoft, only we had no hassle finding the space to inject our code. It is quite ingenious how they managed to compress the code around the patch offset in order to make room for the patch code that required additional 10 bytes. 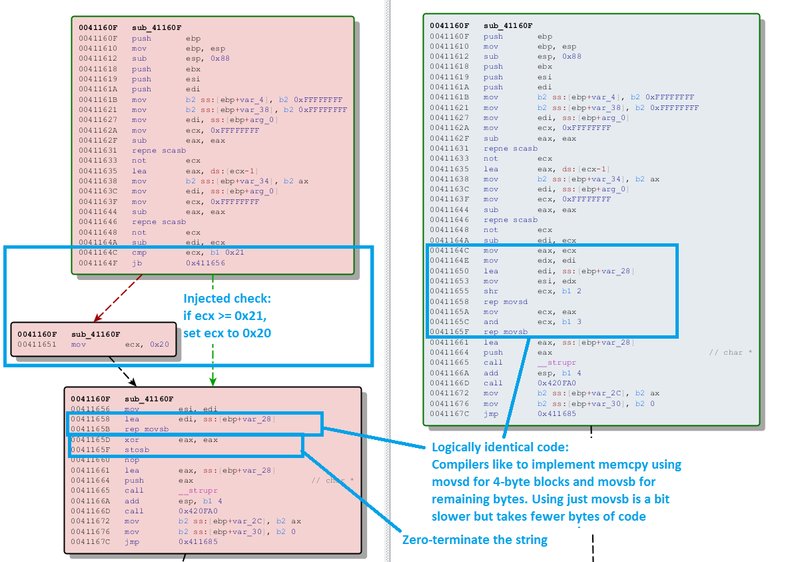 We too need space at the patch offset in order to inject a jmp to our micropatch, however, our technology takes care of automatically injecting these 5 bytes and relocating the original code somewhere else. There are certain requirements that the patch location has to meet (see our 0patch Developer Manual for details), but this is far less constraining than compacting code around the offset like Microsoft had to do. Our micropatches for this vulnerability have been labeled ZP-313 and ZP-314 (there are two slightly different versions of EqnEdt32.exe) and cover all Microsoft Office versions from 2007 to 2016 and 365. As always, if you have 0patch Agent installed, these micropatches should already be present and applied on your system. If not, you can download a free copy of 0patch Agent to protect your system from CVE-2017-11882. It was a surprising and an interesting revelation that official software vendors/maintainers also occasionally resort to manual binary patching. 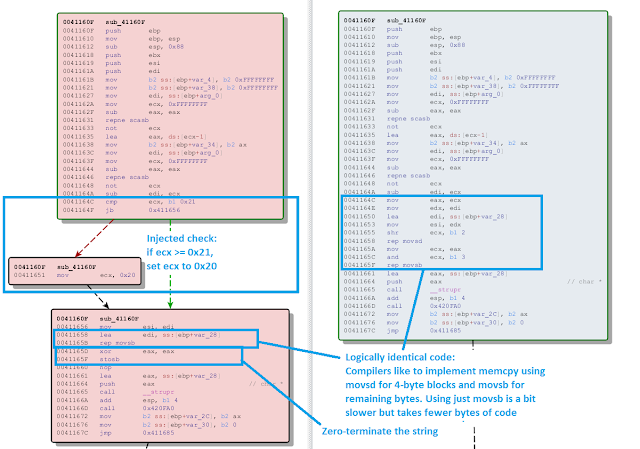 Moreover, our analysis of the official patch has shown that in such cases it is harder to directly patch the binary than to use in-memory micropatching. Lastly it may even turn out to be infeasible to patch some bugs in binary files because the code may already be fully optimized for space and the technique seen in Microsoft's CVE-2017-11882 patch would require and unacceptable amount of effort. In cases like that micropatching can turn out to be more agile than traditional patching. The recent Patch Tuesday brought, among other things, a new version of "old" Equation Editor, which introduced a fix for a buffer overflow issue reported by Embedi. We can see that File version is 2000.11.9.0 (implying being built in 2000), while Date modified is in 2003, which matches the time of its signature (signing modifies the file as the signature is attached to it.) Furthermore, the TimeDateStamp in its PE header (3A0ACEBF), which the compiler writes into the executable module when building it, indicates that the file was built on November 9, 2000 - exactly matching the date in the above version number. We're therefore safe to claim that the vulnerable EQNEDT32.EXE has been with us since 2000. That's 17 years, which is a pretty respectable life span for software! So now a vulnerability was reported in this executable and Microsoft spawned their fixing procedure: they reproduced the issue using Embedi's proof-of-concept, confirmed it, took the source code, fixed the issue in the source code, re-built EQNEDT32.EXE, and distributed the fixed version to Office users, who now see version 2017.8.14.0 under its properties. At least that's how it would work for most other vulnerabilities. But something was different here. For some reason, Microsoft didn't fix this issue in the source code - but rather by manually patching the binary executable. Really, quite literally, some pretty skilled Microsoft employee or contractor reverse engineered our friend EQNEDT32.EXE, located the flawed code, and corrected it by manually overwriting existing instructions with better ones (making sure to only use the space previously occupied by original instructions). How do we know that? Well, have you ever met a C/C++ compiler that would put all functions in a 500+ KB executable on exactly the same address in the module after rebuilding a modified source code, especially when these modifications changed the amount of code in several functions? If you're diffing binaries a lot, you'll notice something highly peculiar: All EA primary values are identical to EA secondary values of matched functions. Even the matched but obviously different functions listed at the bottom are at the same address in both EQNEDT32.EXE versions. As we already noted on Twitter, Microsoft modified five functions in EQNEDT32.EXE, namely the bottom-most five functions listed on the above image. Let's look at the most-modified one first, the one at address 4164FA. The patched version is on the left, the vulnerable one on the right. This function takes a pointer to the destination buffer and copies characters, one by one in a loop, from user-supplied string to this buffer. It is also the very function that Embedi found to be vulnerable in their research; namely, there was no check whether the destination buffer was large enough for the user-supplied string, and a too-long font name provided through the Equation object could cause a buffer overflow. Microsoft's fix introduced an additional parameter to this function, specifying the destination buffer length. The original logic of the character-copying loop was then modified so that the loop ends not only when the source string end is reached, but also when the destination buffer length is reached - preventing buffer overflow. In addition, the copied string in the destination buffer is zero-terminated after copying, in case the destination buffer length was reached (which would leave the string unterminated). As you can see, whoever patched this function not only added a check for buffer length in it, but also managed to make the function 14 bytes shorter (and padded the resulting gap before the adjacent function with 0xCC bytes for style points :). Impressive. Moving on. If the patched function got an additional parameter, all those calling it would have to change as well, right? There are exactly two callers of this function, at addresses 43B418 and 4181FA, and in the patched version they both have a push instruction added before the call to specify the length of their buffers, 0x100 and 0x1F4 respectively. For the other caller, function at address 4181FA, the patched function mysteriously has the push instruction injected without any other modifications to the code that would introduce the needed extra space. As you can see on the above image, the push instruction is injected at the beginning of the yellow block, and all original instructions in that block are pushed down 5 bytes. But why does this not overwrite 5 bytes of the original code somewhere else? It's as if there were 5 or more unused bytes already in existence just after this block of code that the patcher could safely overwrite. To solve this mystery, let's look at the code in its text form. Surprise, the vulnerable version actually had an extra jmp loc_418318 instruction at the end of the modified code block. How convenient! This allows the code in this block to be moved down 5 bytes, making space for the push instruction at the top. Coincidence? Perhaps, but it looks an awful lot like this code block got manually modified before in the past, whereby it got shortened for 5 bytes and its last instruction (jmp loc_418318) was left there. What we've covered so far was related to Embedi's published research and CVE-2017-11882, but is not what blocks Embedi's exploit. The new version of EQNEDT32.EXE has two additional modified functions at addresses 41160F and 4219F0. Let's have a look at them. In the patched executable, these two functions got a bunch of injected boundary checks for copying to what appear to be 0x20-byte buffers. These checks all look the same: ecx (which is the counter for copying) is compared to 0x21; if it's greater than or equal to that, ecx gets set to 0x20. All these checks are injected right before inlined memcpy operations. Let's look at one of them to see how the patcher made room for the additional instructions. There are six such length checks in two modified functions, and just one of them is directly responsible for blocking Embedi's exploit. We believe that Microsoft noticed some additional attack vectors that could also cause a buffer overflow and decided to proactively patch the other five memcpys and the patched function we covered earlier. This is good. Enabling ASLR on EQNEDT32.EXE will make it harder to exploit any remaining memory corruption vulnerabilities. For instance, Embedi's exploit would not work with ASLR because it relied on the fact that the call to WinExec would always be present at the same memory address; this allowed them to simply put that address on stack and wait for the ret to do all the work. Maintaining a software product in its binary form instead of rebuilding it from modified source code is hard. We can only speculate as to why Microsoft used the binary patching approach, but being binary patchers ourselves we think they did a stellar job. This old Equation Editor is now under the spotlight, and many researchers are likely to start fuzzing it for additional vulnerabilities. If any are found, we'll probably see additional rounds of manual binary patches in EQNEDT32.EXE. 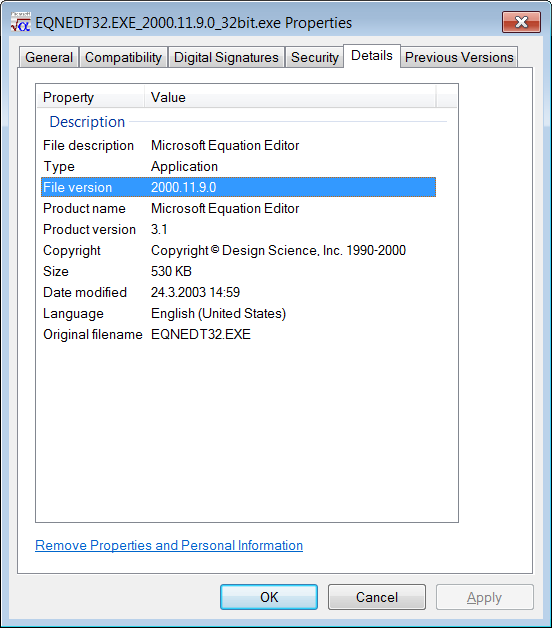 While Office has had a new Equation Editor integrated since at least version 2007, Microsoft can't simply remove EQNEDT32.EXE (the old Equation Editor) from Office as there are probably tons of old documents out there containing equations in this old format, which would then become un-editable. Now how would we micropatch CVE-2017-11882 with 0patch? It would actually be much easier: we wouldn't have to shrink existing code to make room for the injected one, because 0patch makes sure that we get all the space we need. So we wouldn't have to come up with clever hacks like de-optimizing memcpy or finding an alternative place to temporarily store a value for later use. This freedom and flexibility makes developing an in-memory micropatch much easier and quicker than in-file patching, and we believe software vendors like Microsoft could benefit greatly from using in-memory micropatching for fixing critical vulnerabilities. Oh by the way, Microsoft also updated Office's wwlib.dll this Patch Tuesday, prompting us to port our DDE / DDEAUTO patches to these new versions. 0patch Agent running on your computer will automatically download and apply these new patches without interrupting you. If you don't have 0patch Agent installed yet, we have good news for you: IT'S FREE! Just download, install and register, and you're all set. P.S. : If you happen to know the person(s) who did the binary patching of EQNEDT32.EXE, please send them a link to this blog post. We'd like them to know how much we admire their work. Thanks! In September 2017, Qihoo 360 Core Security detected an in-the-wild attack that leveraged an Office 0day vulnerability now known as CVE-2017-11826. The attack employed an RTF document with embedded DOCX Word documents, whereby one of them exploited the vulnerability to cause type confusion in the OOXML parser, Microsoft's parser for Office Open XML File Formats. Additional noteworthy analyses of this vulnerability subsequently came from McAfee and Kaspersky. Yang Kang, Ding Maoyin and Song Shenlei of Qihoo 360 Core Security reported this issue to Microsoft, which fixed it in their October security update. This vulnerability is particularly easy to exploit, as it only requires the user to open a malicious RTF document in Word (which is the default RTF editor when installed), and isn't mitigated by Word's Protected View. It is actually surprising that it's not getting exploited more widely, as attackers know very well that many organizations need weeks or months to apply software updates. Once we got the exploit file* we could start the analysis. We first minimized the exploit file by removing unnecessary payload and effectively turning it into a crash PoC. Turning a working exploit (one that reliably executes malicious code) into a crash case is an important step for us because in contrast to malware analysts, we're not interested in what malware does when it gets control, but only how it gets control. Making an exploit crash instead of execute its code generally leads us closer to the vulnerability that gets exploited - and closer to writing a patch for it. It's also easier to test a patch, once you have one, with a simple and quick test case. This looks like a call to a vtable function, and since we already learned from Kaspersky above that we're dealing with a type confusion issue, it's likely that we're looking at a case of code processing an object of some expected type with the address at ecx+4 supposedly pointing to a valid function, while the object is actually of a different type. Type confusion flaws are not the easiest kind to patch if you don't have the source code. While the fix is usually in the form "if type != EXPECTED_TYPE goto GET_OUT_OF_HERE", it's not trivial to figure out where the said type resides in the object without looking around the code where else the same type may be used. Once you have that figured out, it's relatively simple to determine the EXPECTED_TYPE by observing the type value with legitimate test cases and comparing that to the value when you process the PoC. Finding a suitable GET_OUT_OF_HERE location also needs some figuring out: you want the patched code to escape the flaw gracefully without leaving a corrupted state or cutting off some legitimate functionality. So sometimes this can get time consuming - but in this case, we had the official fix so we could peek into what Microsoft did to correct this flaw. The patched function is on the left, the vulnerable on the right (click the image to magnify). It's easy to see that the patched function introduced a branch before the grey-marked code in the vulnerable function. And it looks exactly like "if type != EXPECTED_TYPE goto GET_OUT_OF_HERE": it starts with a check for a specific value, and if there is no match, execution is diverted to some new code (marked "Safe exit code" above), which avoids the call that crashed. Note that 0x31E94A4A is actually an address of some function in wwlib.dll, which gets stored to the address pointed to by eax+0x48 a couple of blocks earlier in the same patched function. So what Microsoft's patch seems so do is check the validity of the object not by inspecting its type (perhaps there is no type ID in the structure at all), but by inspecting the address of a function pointed to by the object. Why not - as long as it works. No one in the world knows this code better than Microsoft's developers and if they thought this was the best possible fix, they're probably right. We wrote a CVE-2017-11826 micropatch for 32-bit Word 2010's wwlib.dll version 14.0.7182.5000. While it's generally simple, and often fully automatable, to port a micropatch to other module versions, we prefer to do that on demand for now. So if you're running any affected Office version and for any reason can't apply Microsoft's official update (yet) but would like to be protected from this highly exploitable vulnerability, do let us know at support@0patch.com. We'll port the micropatch to your version and make it available for everyone else too.